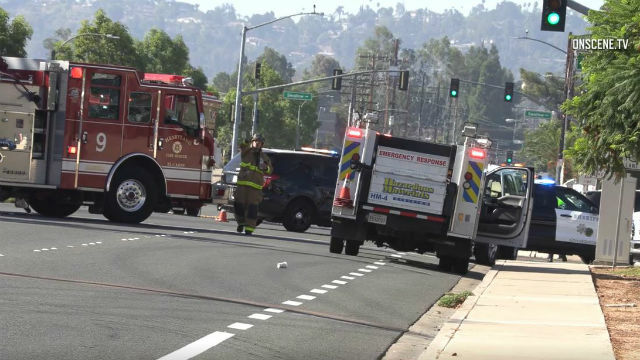 Hydrogen vapors from a tanker truck briefly ignited Wednesday, prompting precautionary evacuations of several El Cajon businesses and schools, authorities said. Dispatchers received initial reports around 8:10 a.m. of an explosion linked to a hydrogen truck fire at 1717 Cuyamaca St., just south of Gillespie Field, Heartland Fire and Rescue public information officer Mark Casey said. He said a 1,500- to 2,000-gallon tanker truck carrying liquid hydrogen was being refilled at Veridiam, a manufacturing plant, when hydrogen vapors briefly ignited, but did not result in a fire. Arriving crews found the truck was not on fire, but was actively venting hydrogen, Casey said. He said the San Diego County Sheriff’s Department evacuated people from businesses and residences in a two-block area stretching from Cuyamaca Street to North Marshall Avenue. Around 150 students co-located in school programs at Idea Center High School, Chaparral High School and Merit Academy were evacuated to the gymnasium at Grossmont High School, Grossmont Union High School District spokeswoman Catherine Martin said. As of 9:30 a.m., all students had been removed from the area, she said. Hazardous materials teams from San Diego County and the city of San Diego were dispatched to the scene, and residents were advised to avoid the area for the next several hours, Casey said. The Sycuan Green Line wass rerouted at Arnele Station and the Orange Line was rerouted at El Cajon Transit Center, according to San Diego Metropolitan Systems. Hydrogen is a colorless, odorless, highly flammable gas that is used in industrial processes and recently as a vehicle fuel.